Ya'll have seen the bookcase in my studio. Well, today I had a brainstorm. indefinitely, so this idea suddenly came to mind …. 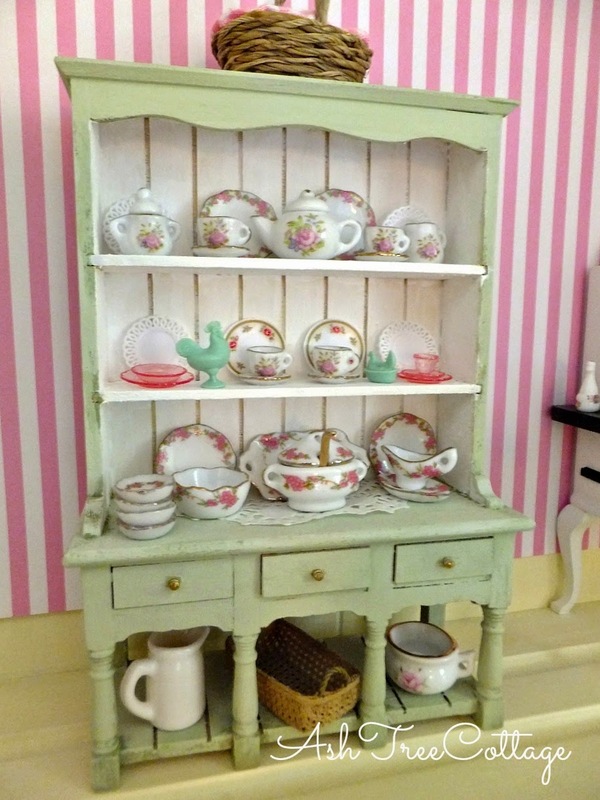 I do like the hutch against the pink and white striped paper. The island has some room to spread out. The vintage stove seems content here. and maybe add a shelf or a plate rack up above. The little gray cells are working overtime now! the Masters Golf Tournament. We are very traditional around here. Whoops ~ a little piece of cheese just fell onto the kitchen floor. Guess who cleaned it up for me? How precious! Love the idea. Must find me a bookcase cause I don't know if the dollhouse is ever going to get done. Really do like this. Pink striped background is perfect. Oh my goodness! That is adorable! Every single little detail - beyond even what a "real" house usually has! Right now I'm wishing I was a little mini-mouse and I could get away with living there! I'd be in heaven! 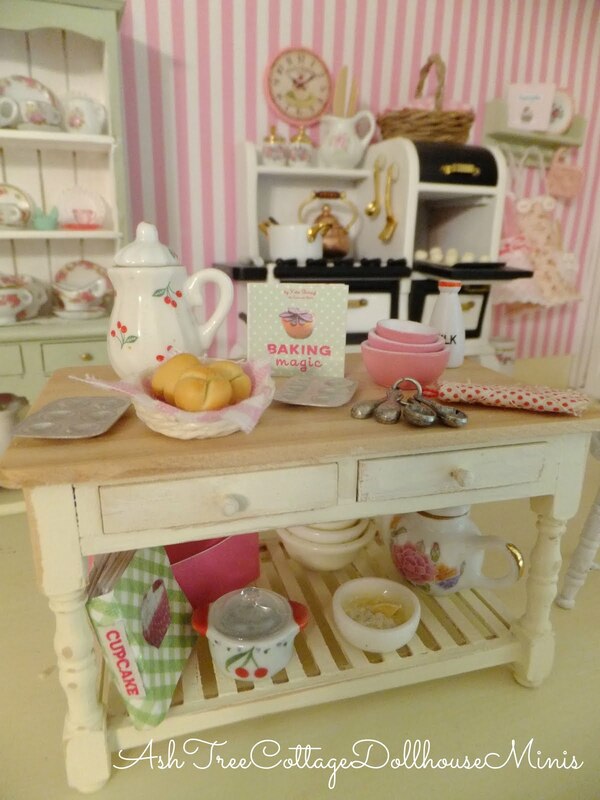 I want to shrink myself down and move in ;-) Why is it that life is always more interesting in miniature??? Such a great idea! Could you tell me where you found the "wicker" side table? 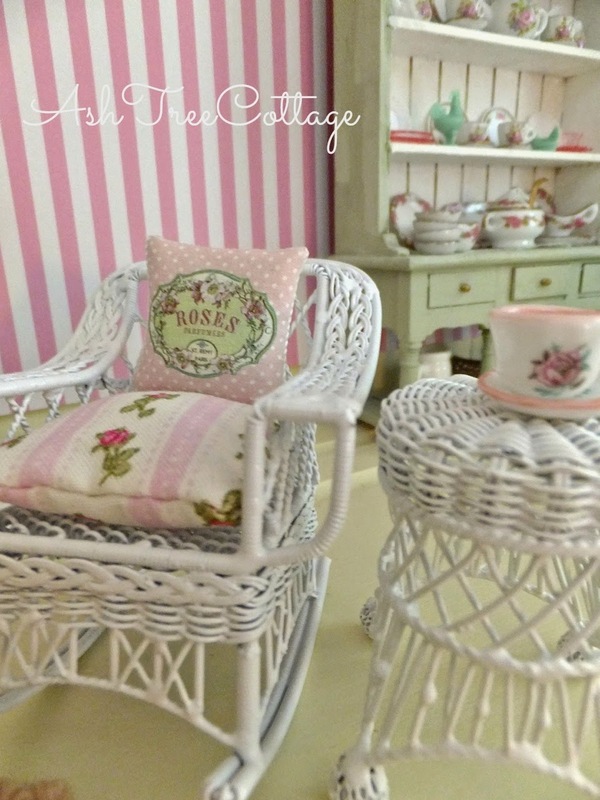 Certainly ~ both the wicker rocker and chair came from New England Miniatures about a year ago. If they don't have it other sites will. Let me know if you need options. I'm loving your new mini dwelling. My sister and I used to clear off the bedroom bookcase for a dawn doll apartment. 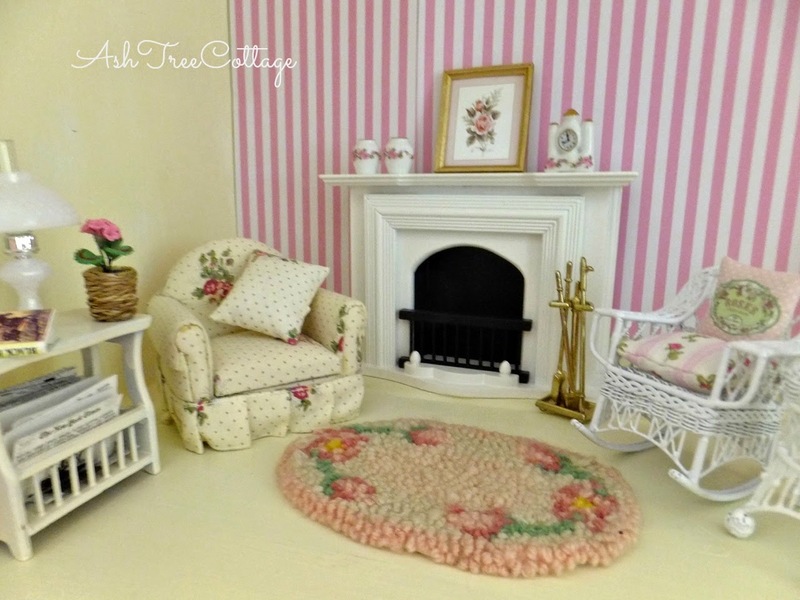 I always love your dollhouse updates. Susan a little frilly skirt around the sink & a shelf above is just the ticket to round out that space. Maybe you could find some cute little rooster & hen minis to put on the shelf. I was so tired of my minis being stored away that I brought some out & put them here & there on my shelves. Yours look enchanting. I did a close up & see there are 2. Love them both, but especially the hen on the basket. Green to boot! My favorite color. Those rose colored dishes are very pretty too. Where'd you get those? As a child I had a Ginny doll, still have her, she was my fav !! 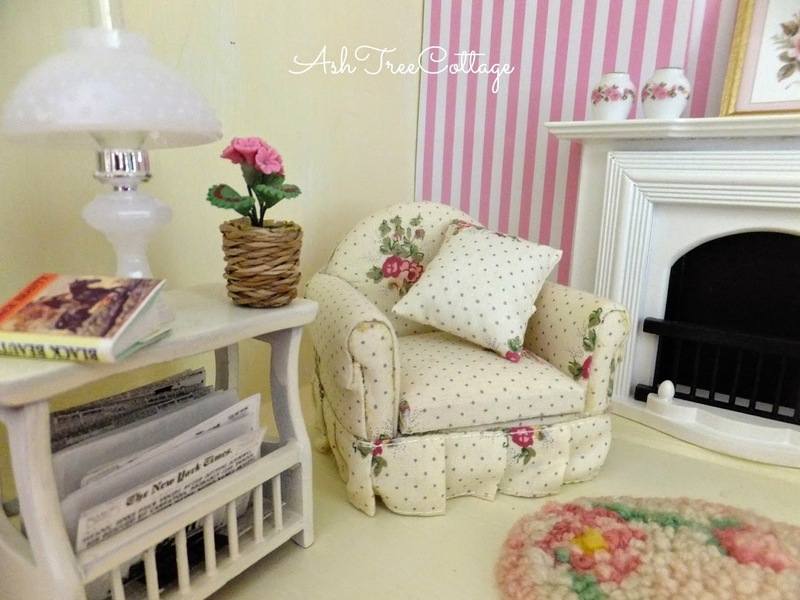 Anyway, didn't have a house to fit her and her furniture so I used the little white bookcase in my bedroom. The first shelf was the kitchen and living room, second was the bedroom and all her clothes on those little hangars....the third was the bathroom and attic storage. I cut out pictures of windows with curtains from the Sears catalog and glued them to the walls and other cute things to decorate with. Using manila folder paper, I made pieces of furniture by folding and gluing. What fun that was!!! Sounds like you are having fun too........and that's what it is all about!!! You have a very creative spirit! This is so adorable..each and every piece! I think it's very pretty! 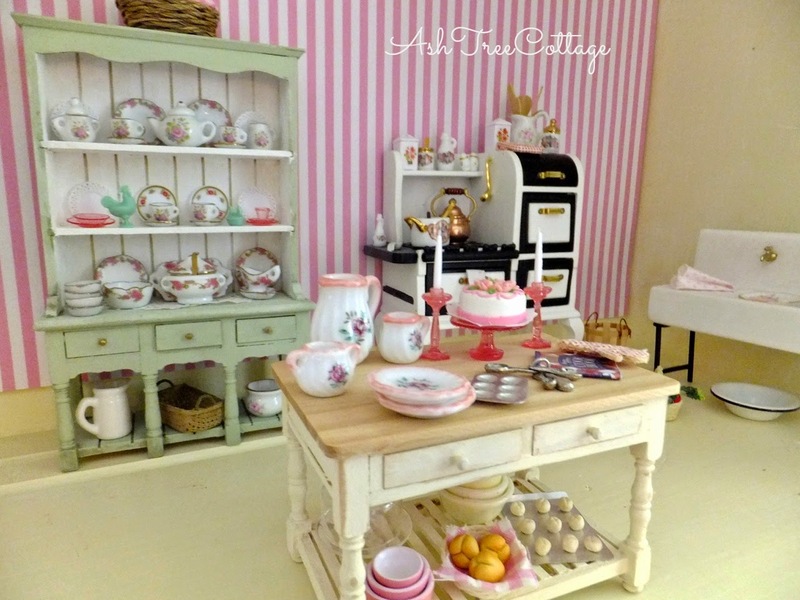 Different than just a plain dollhouse. So cute! Want it in adult size! Love it! 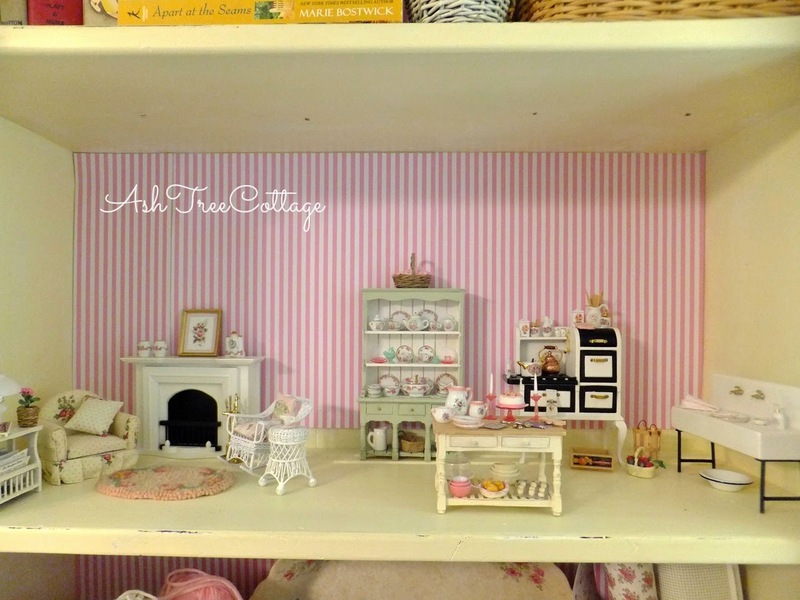 I have always loved doll houses! We had a big old HEAVY STOVE identical to that one in our old Victorian house. It was great for storage! 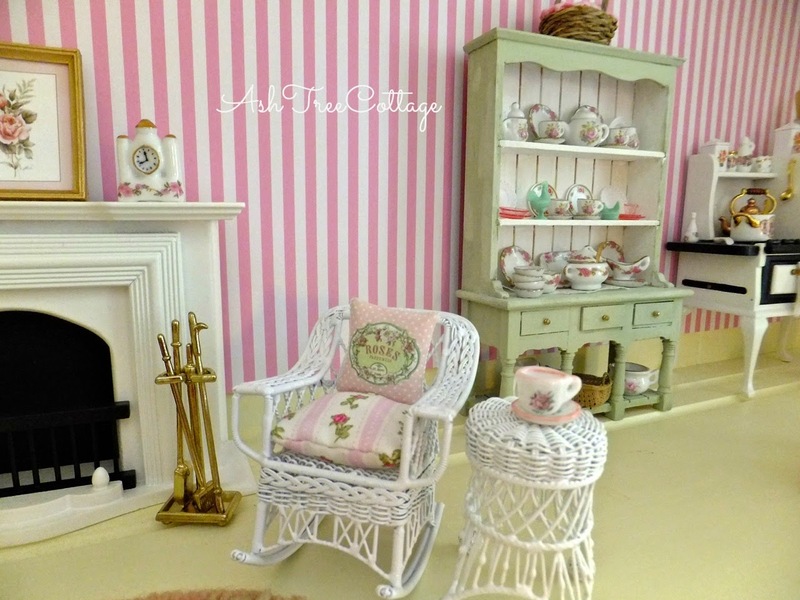 I love all your pretty miniatures and the stripe wall paper is perfect. 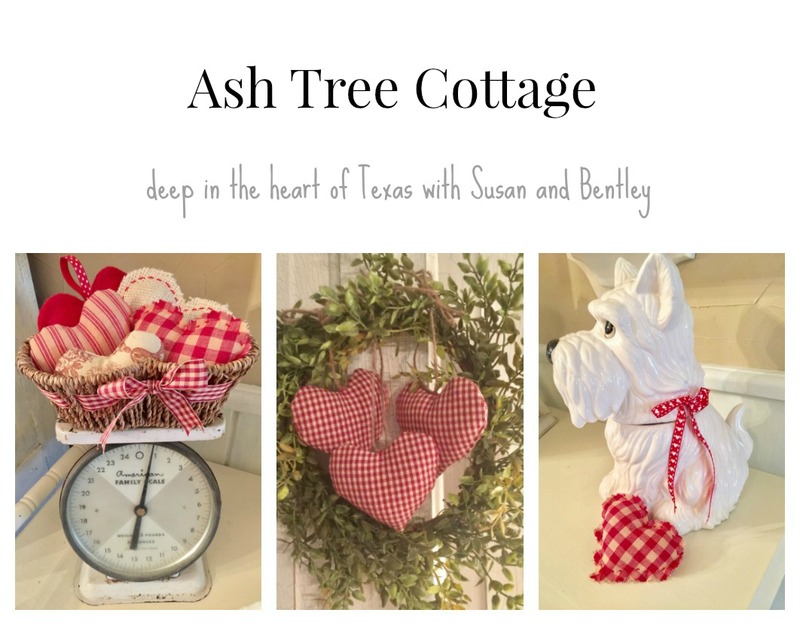 Wow Susan, your post is lovely and the new look to your blog, I haven't been off of blogloving a lot lately. Your post reminded me of my obsession with Queen Anne's doll house at Windsor Castle, after a visit when I was a young girl. Just better because it is more my style. 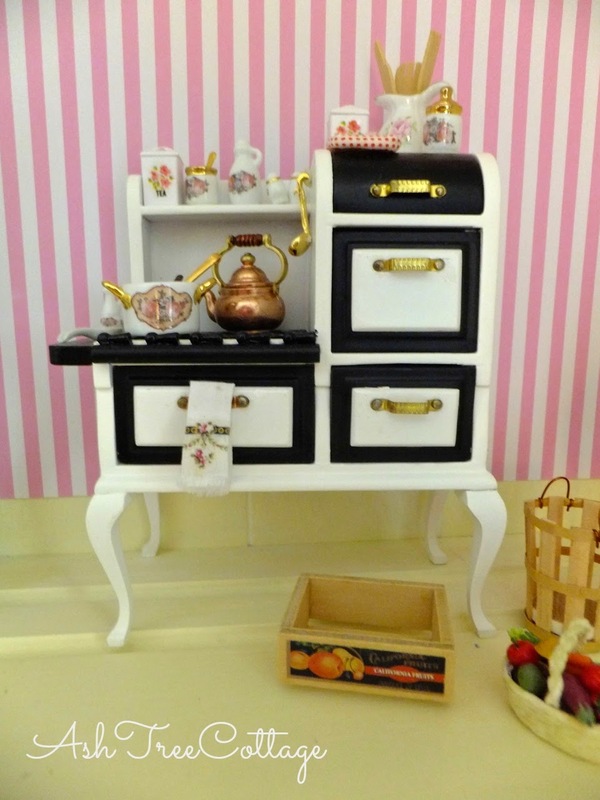 Love the dresser/hutch!! So pretty! Great inspiration for today, thanks! Greetings from Switzerland, hope you are enjoying the Spring in Texas! Love this idea! 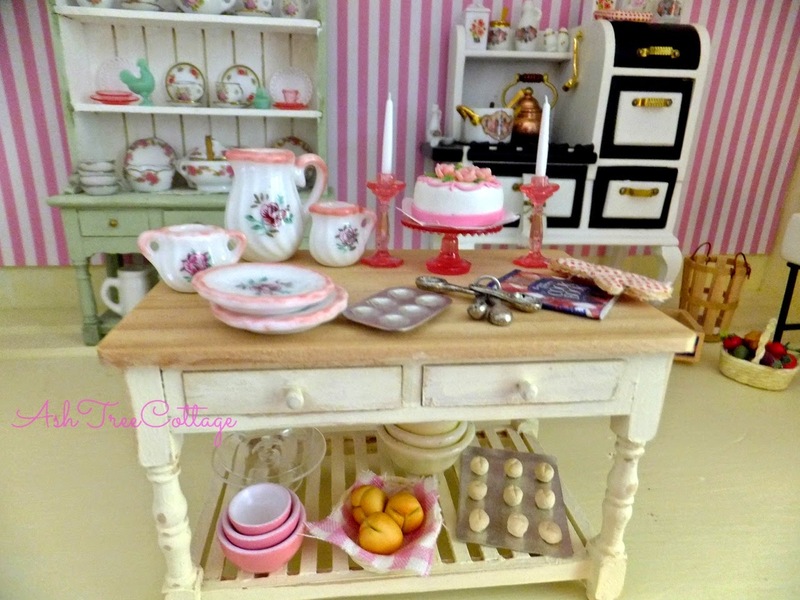 I have a dollhouse that is precious and waiting for renovation and no place to put it! I do have some shelves that are narrow and might be ideal for such an idea. They are in my library which is pink and white so it might just be perfect! Thanks for this! Yours looks beautiful! !